A nice summary with Colin Camerer, Ralph Adolphs, etc. Thanks to Investing Pinoy for the link. Like any other science, neuroscience has its founding myths, historical anecdotes, legendary figures… Phineas Gage is one of the most famous. He was a railroad worker who, on September 13, 1848, was victim of a dynamite explosion which sent a long metal pole through his left chick, eye orbit, brain, and got out the top of his head. Much of the medial region of his prefrontal cortex was just suddenly wiped out… and Phineas Gage survived. This made him a living experiment in the role of the brain in higher cognitive functions. The myths has it that his basic cognitive skills were undamaged, but that his social behavior shifted dramatically – Phineas became much more irritable and aggressive. The amazing event is that a daguerreotype of him has just been identified, and that is the buzz of summer ’09 in the community of neuroscientists! The daguerreotype was in a collection for years, but the owners thought it was the portrait of a whale hunter. 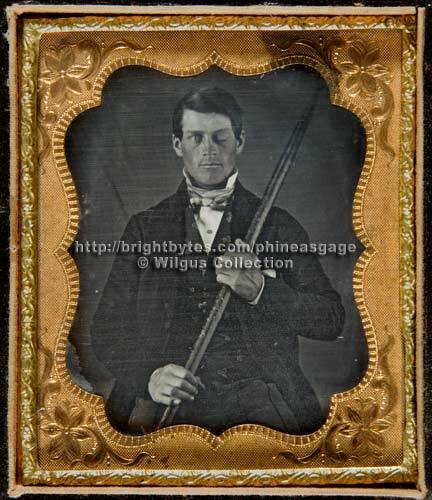 So please join me in greeting Phineas Gage. Note the metal pole in his hand: yes, it is the one which pierced his crane.